It’s Time to Get an FFL! Waiting to Get Your FFL? Like many Americans, you might have been hesitant to get an FFL because (1) you didn’t understand the process to get your FFL license, (2) you don’t know the many rules and regulations to follow and/or (3) you were concerned about dealing with the government because they haven’t exactly proven to be friendly to the firearms industry. Well, I’ve got some good news. . .
RocketFFL has already solved the first two problems for you and President Trump is now working on the third! The RocketFFL guide on how to get your FFL walks you through the entire process and explains necessary rules and requirements along the way. And once you’ve got your FFL, the follow-on courses in ATF Compliance help you to learn ATF firearm rules and regulations and how to comply with them. At the 2017 NRA Annual Meeting, President Trump addressed a crowd of attendees and committed to work by the side of gun-owners and the firearms industry. He’s the first President to talk to the NRA since President Reagan. 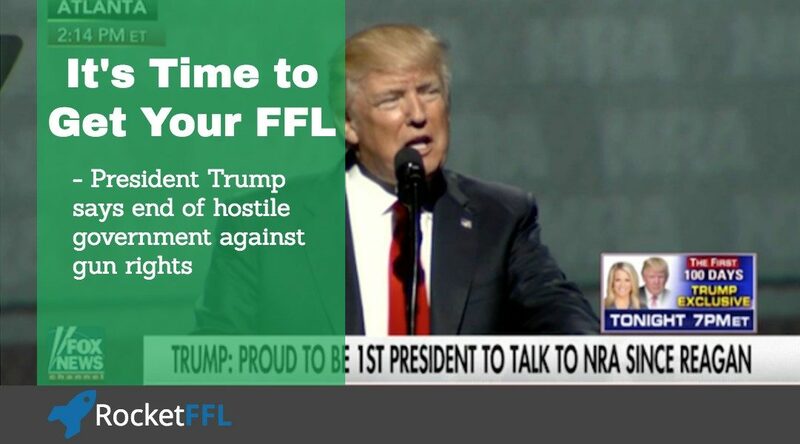 If President Trump is right, it looks like you just ran out of reasons to not get your own FFL license! You might as well sign up for your free trial of the Get Your FFL Course today. “…it’s been a tough fight against those who would go so far as to ban private gun ownership entirely. But I am here to deliver you good news. And I can tell you that Wayne and Chris have been here fighting with me long and hard to make sure we go with you today and not somebody else with an empty podium – because believe me, the podium would have been empty. They’ve fought long and hard and I think that you folks cannot thank them enough – they were will us all the way, right from the beginning. But we have news that you’ve been waiting for for a long time: The 8 year assault on your 2nd amendment freedoms has come to a crashing end. You have a true friend and champion in the White House. No longer will federal agencies be coming after law abiding gun owners. No longer will the government be trying to undermine you rights and freedoms as Americans. Instead, we will work with you by your side. We will work with the NRA to promtoe responsible gun ownership – to protect our wonderful hunters and their access to the very beautiful outdoors. You’ve met my sons and I think you can tell that they love the outdoors. Both sons, they love the outdoors. Frankly, I think that they love the outdoors, by a long-shot, more than they love 5th Avenue.